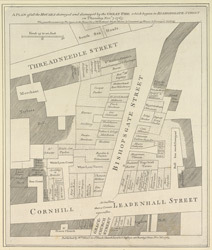 Small plan of the part of Cornhill damaged by the fire of November 1765. The plan features title along the top, scale bar at top left and imprint below the plan. The fire which broke out in the early hours of the morning in Mr Rutland's peruke making shop in Bishopsgate Street, destroyed forty nine houses damaging a further fifteen.